Whether you Sponsor the Farm for a Day or become an Event Sponsor, you gain valuable exposure for your business or foundation as you provide important support to Lynchburg Grows. We have two major events each year: The Salad Days in late spring, and A Greenhouse Dinner in the fall. Sponsors of these events get free tickets, plus inclusion in our marketing, and special recognition at the events. If you are interested in becoming an event sponsor for 2019, please fill in the Sponsorship Sign Up form below or contact shelley@lynchburggrows.org. This event celebrates spring with a picnic dinner on the lawn, live music from Firecracker Jam, an outdoor bar, and more. Guests create their own masterpiece salad dinner at an all-you-can-eat salad bar in the greenhouse. Salad ingredients are from Lynchburg Grows and other local farms, while toppings and dressings are provided by local restaurants. $300 Level: Two tickets to the event; your company logo featured on all marketing materials and in social media promotions of the event. Special recognition at the event. $150 Level: One ticket to the event; name listed on all marketing materials. 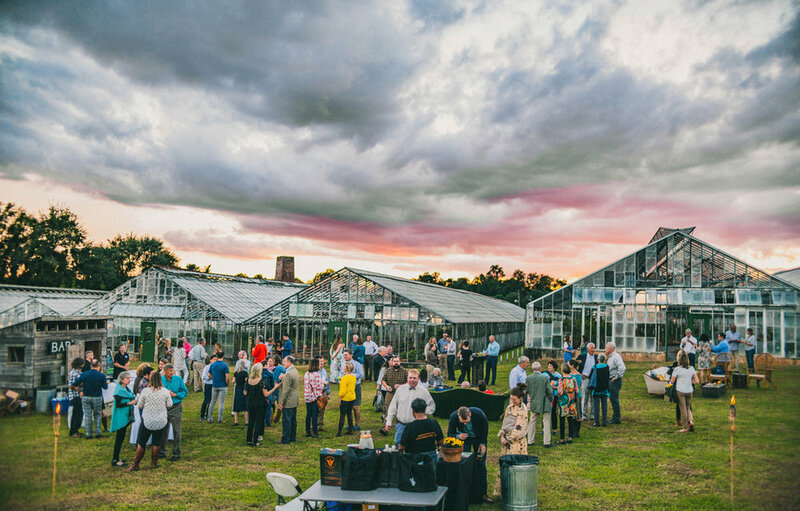 Quickly becoming one of the highlights of the harvest season in Central Virginia, our biggest event of the year has sold out fast in its first three years. 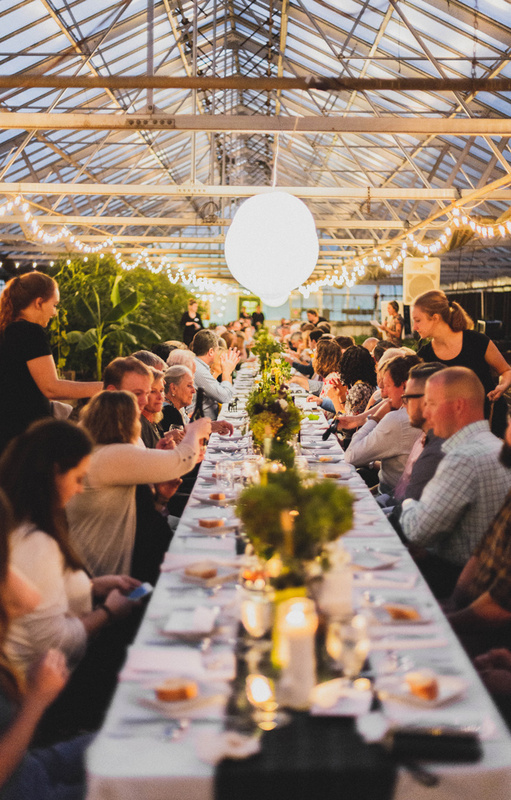 For one night only, we transform our largest greenhouse into a stunning venue for a gourmet, farm-to-table meal by a different chef each year. The evening begins with a sunset cocktail hour on the lawn. Guests are welcome to stroll through the greenhouses to see all that we have growing, then join us in the greenhouse for a sumptuous dinner. $5,000 Level: Six tickets to the event with reserve seating for your group; your company logo featured on all marketing materials and in social media promotions of the event. Your logo on the evening’s program, special recognition at the event, plus a custom event promotion, such as a hanging banner or drink coasters. $1,000 Level: Four tickets to the event with reserve seating for your group; your company logo featured on all marketing materials and in social media promotions of the event. Your logo on the evening's program and special recognition at the event. $500 Level: Two tickets to the event; name or small logo listed on all marketing materials and on the evening's program. Recognition at the event. The total cost of running the farm for one day is approximately $1,000. When you sponsor the farm for a day, we'll share your logo and message to our 3,500 followers on Facebook and 2,000+ on Instagram. Your day sponsorship is especially valuable to us, too, because your unrestricted funds support daily operations (not usually possible with grant funding). If you are interested in sponsoring the farm for a day at the $1,000. level, please contact Executive Director Shelley Blades at shelley@lynchburggrows.org. Alternatively, you can fill in the Sponsorship form below and use the message field if you would like your sponsorship to honor someone on a certain date, plus any other information you would like us to know. Please see the information above for details on the benefits of each sponsorship level. Success! We have received your information and will be in touch with you soon. Thank you! If you would like to pay for your sponsorship online, please SUBMIT your information first, using the form above, then use the Square check-out button below.